Do you looking for stylish UI for your next Mobile Apps? Do you want to reach a new market and new users? Are you frustated to make user friendly UI design? Do you want to develop your mobile apps faster? Or you just want to update your old apps to a fresh one? 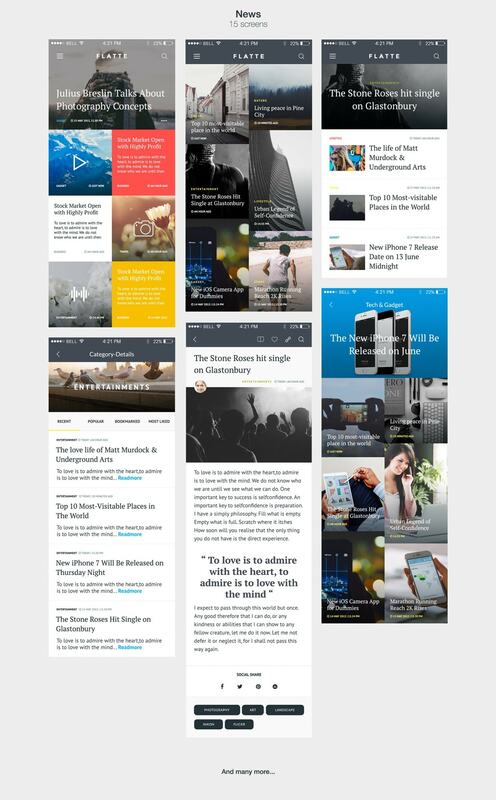 Our Flatte UI Kit crafted by an expert designers. Expert designers who knew all about user interface, user interaction, user experience, mobile apps trends, and arts. Forget to hire some expert designers to build UI designs for your Apps, it will make a long time development. We already do it for you, what you must do is just make purchase now. You know, you are so lucky today. Because in this period we have some promos. And for this Amazing Flatte Mobile UI Kit we just bundled it in half price (include 8 awesome bonus that worth $280). Buy now, just by click Purchase button in right side, Checkout, Pay, then Download it. So, you are ready for wonderfull apps developments. The simple layout of the app Flatte Mobile UI Kit makes your App developing process incredibly easy. Flatte UI Kit contains 75 Screens , 1000++ UI Elements in 6 Categories – It’s a perfect, fresh and stylish UI Kit for building your own App. All components are shape based, fully compatible, editable and pixel perfect. Create new sections instantly and make a beautiful and unique layout for any desirable topic. Our Flatte Mobile UI Kit has been developed for those who know everything about design and delivery. We have a good news for you, now you can buy with Special Discount 50% Only for today . Use this promo code “OFF50” and grab premium Flatte UI Kit. Let’s create something new and beautiful Flatte UI Kit. Build Apps Awesomely Now ! What do you wait for? Your apps user seems cannot wait for your powerful any longer. Download Mobile UI Kit 2 right now, save your time 90%, socialize your apps!